Every year millions of people make turkey and stuffing. Most just make the normal sage stuffing. 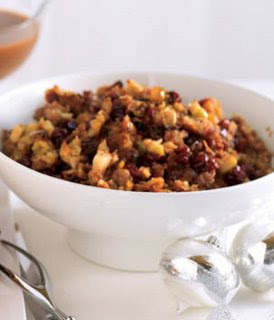 Now that we live in the day and age of instant everything even our stuffing is instant. I am willing to bet that most people just grab a box or a bag of stuffing each year. I will admit that I use stuffing mix. One of my little known secrets is that I cheat at cooking often by adding extra things to prepared mixes. It speeds things up and still tastes homemade. For stuffing I add onions, celery, and real broth to the prepared mix. This year I wanted to do something a bit different. As I thought about it I realized that I have never made my mother’s sweet stuffing. When I was growing up my mother always made two pans of stuffing. One was normal sage and one was sweet. This year I will try to make her sweet stuffing. This will be more of a guideline than a recipe. When I called my mother for the recipe she laughed and said that she has never wrote it down so she has no clue. She gave me her best guess at amounts though. I will just try it and see what happens. Sweet Stuffing is made with sage stuffing mix to make it easy right from the start. Yes my mother cheated while in the kitchen just like I do now. Combine wet and dry mixtures without breaking apart the bread cubes. It is good to have a little extra broth on hand just in case. Place the stuffing mixture in a buttered baking dish and bake covered for about 45 minutes at 350 degrees. That sounds delicious … I can’t wait for Thanksgiving! Thats interesting! I don’t like boxed stuffing and mom always makes her homemade stuffing at Thanksgiving, but it is tough to make for an everyday meal. I never thought of doctoring up boxed stuff- thats an idea I’ll hold onto for my daily life! That stuffing recipe sounds yummy! I am like you, I often will use a mix and dr. it up-kind of like the semi-homemade cooking show!